"Surprisingly light but decadent-tasting salad. 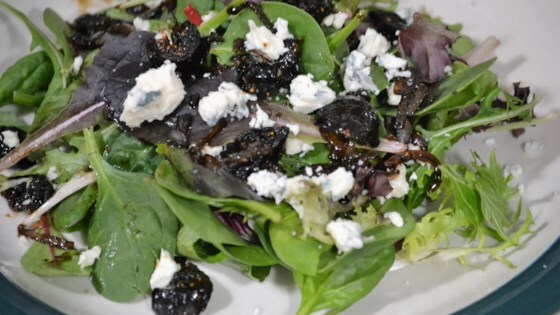 The balsamic reduction provides enough moisture so that no additional salad dressing is needed. Serves 2 entree-sized salads or 4 small appetizer salads." Heat olive oil in a skillet over medium-low heat; cook and stir onion with a pinch of salt until lightly browned and caramelized, 10 to 15 minutes. Add figs and balsamic vinegar to onion; cook over medium heat until vinegar is reduced by half, about 5 minutes. Season fig mixture with salt and pepper. Spread spinach onto serving plates and top with fig mixture and Gorgonzola cheese. I really liked this flavor combination but it's not for everyone. It's so rich! Easy to make and delicious. It was delicious.. also a great way to take advantage of the beautiful seasonal figs we get in AZ.